Everyone has his or her favorite cultural icon, right? 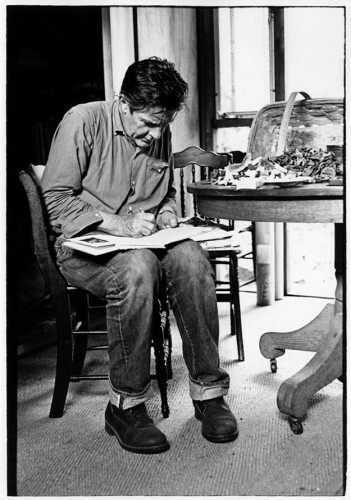 I do too, and mine is John Cage. He grew up in southern California, lived most of his life on the east coast of the US, and was a composer, among many other skills and specialties. 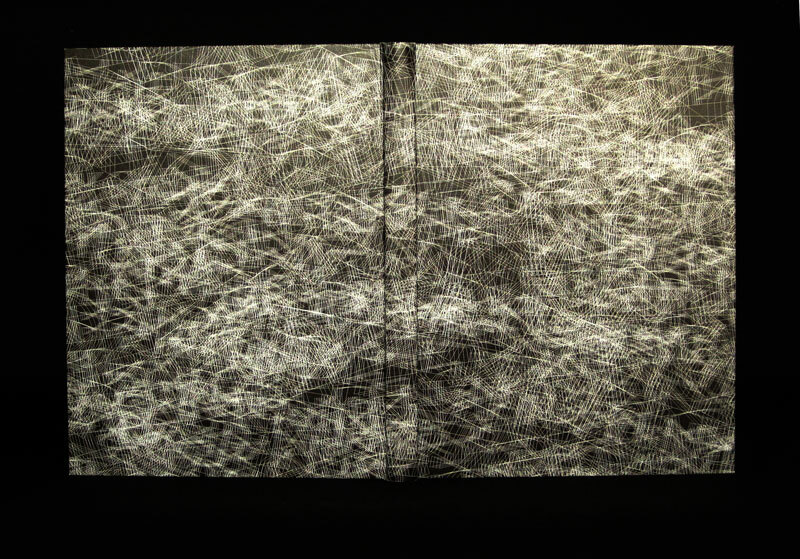 His music is sparse, abstract, noisy, at times loud and harsh and at other times perfectly quiet and peaceful. In some ways a product of American culture and history, in others a radical departure, Cage was at all times a hard worker, completely devoted to creating music and bringing sounds together. He brought this same focus to his side pursuits, such as mushroom gathering and macrobiotic cooking, as well. His whole life, as a synthesis of all of these dynamic activities, went into his compositions and recordings. Cage’s mycological collection is at UC Santa Cruz!! Let’s go!! We also have just a few books containing his lectures and poems, such as Silence and Indeterminacy. 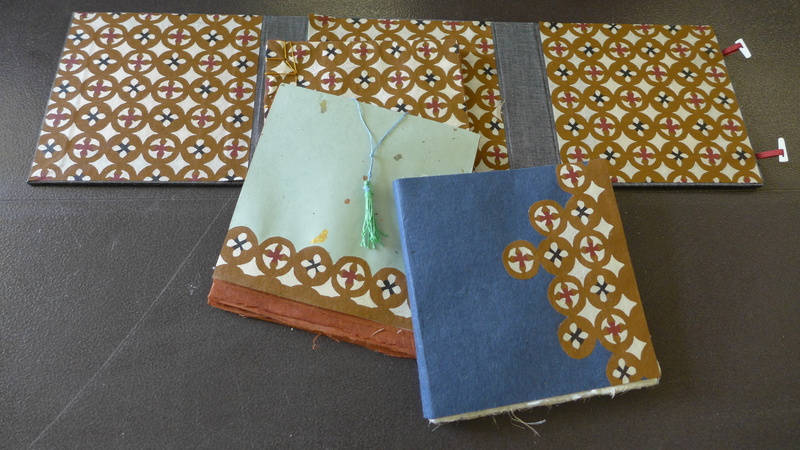 There is so much more to explore about Cage’s life, music, and philosophy, but this is a bookbinding blog. What I wanted to share about Cage is one of his writings I happened across, very much in chancy Cage-like fashion, at the Prelinger Library. Cage had mixed opinions about formal schooling, having dropped out of Pomona College as an undergraduate, though he was valedictorian of his high school class. I think it can be comfortably said that he continued to learn, study, and teach throughout his life, and that the concept of lifelong learning–questioning assumptions, gathering data, and growing and adapting–was central to his thinking. I wanted to share the following piece in light of the classes I will be teaching soon, as well as the classes I have been taking lately. The past year has been a very active one for me, filled with growth and change. 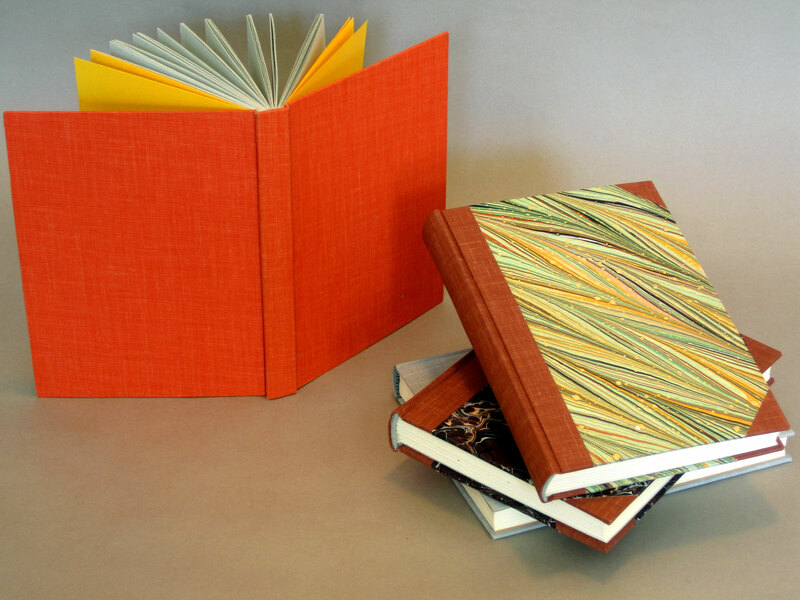 It has been over eleven years now since I received my diploma in bookbinding, and so I have had nearly adequate time to begin to practice and reflect on what I learned there. But now, it is time for me to resume my pursuit of learning, growth, and adaptation. 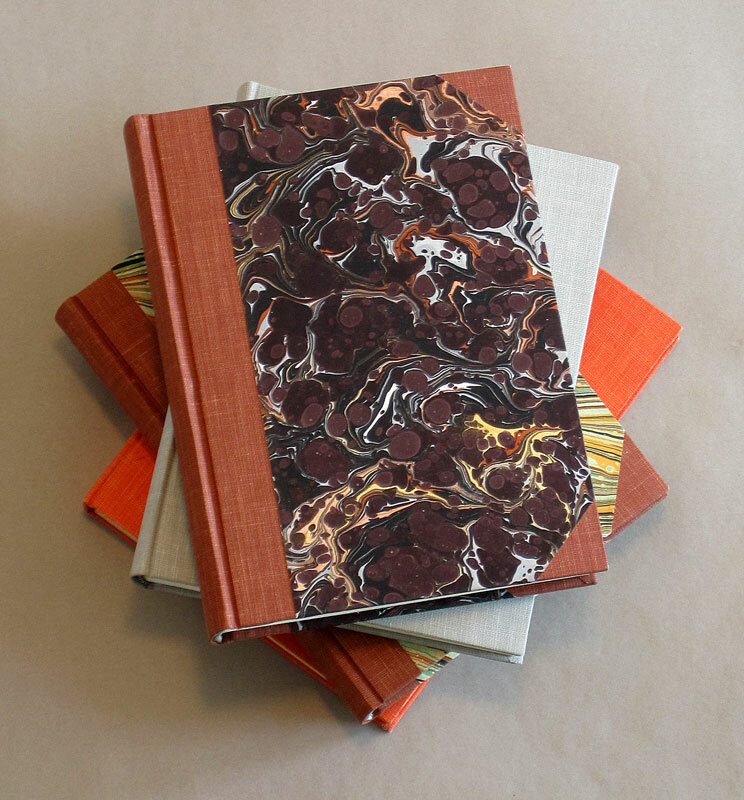 Last summer, I took the Design Binding Intensive class from Dominic Riley. I think Dominic is a very Cage-ian instructor: eccentric, with unparallelled skill, completely engaged in his classes, often taking us on field trips and giving us lots of concrete information. I also taught some classes, some at home and others further afield. Creative interpretation by a student in one of my classes. Brilliant!! This summer, I will be taking some classes at the Campbell Center for Historic Preservation in northwestern Illinois. 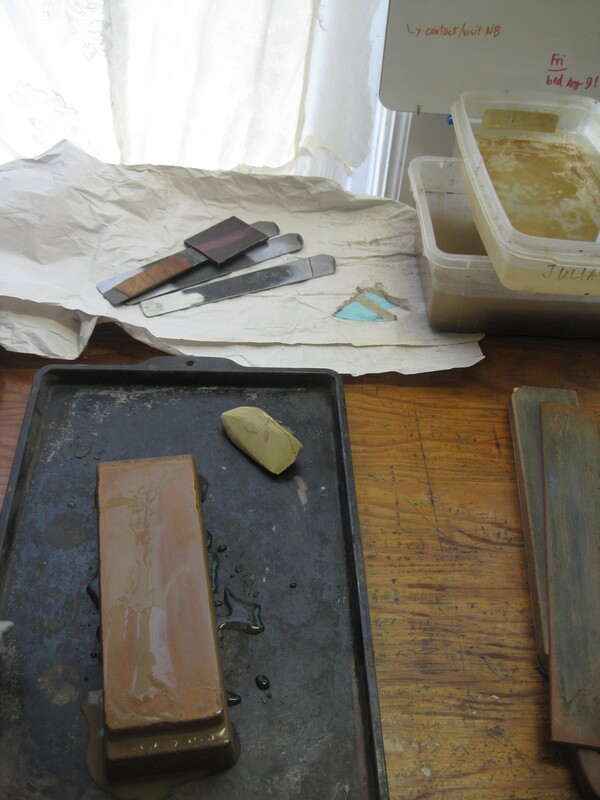 And last weekend, I took a class in finishing with gold leaf taught by Gavin Dovey to refine my skills. I believe there is always more to learn in any field, but especially in a field like bookbinding, and I am grateful to have found a profession for which there is always room for expansion. I have been teaching bookbinding for years, and feel that I often learn more from my students than they learn from me… Perhaps these few lines from Cage explain why. RULE #4: Consider everything an experiment. RULE #5: Be self disciplined. It is the people who do all of the work all of the time who eventually catch on to things. You can fool the fans— but not the players. RULE #8: Do not try to create and analyze at the same time. RULE #9: Be happy whenever you can manage it. Always be around. Come or go to everything. Always go to classes. Read everything you can get your hands on. Look at movies carefully and often. Save everything. It may come in handy later. It is sponsored by my local bookbinding organization, and will be a great way to begin the festivities relating to Codex and the Antiquarian Book Fair. I’m hoping we will record it in some way, but the best way to experience it will be in Cage-ian fashion: be there. Yesterday and today, I have been working on a special project: making lifting knives for my Intro to Book Repair students. I have to make seven of them, which is twice as many knives as I have ever made at once, and seven times as many as I have ever made of one type. It takes a long time to make even one good knife by hand, so it’s a fair job for me. I began by visiting Noisebridge, a local hacker space which also happens to have a wood shop, to use their bench grinder to grind the high-carbon Sheffield steel blanks down to the right shape. A few of the young computer guys would come in and chat with me from time to time about what I was doing, and I got a lot of raised eyebrows. It turned out one of the guys who keeps up the wood shop is from Madison, so we got to talk about how much we miss a good cheese curd. Two other dudes came in to use the router in order to make a slit drum, and there was a lady making phoenix stencils and painting and sanding pieces of wood. Meanwhile, outside the wood shop, Noisebridge is having its weekly 10 minutes of fame event, where people share what they like to do. The place is packed! I heart SF. 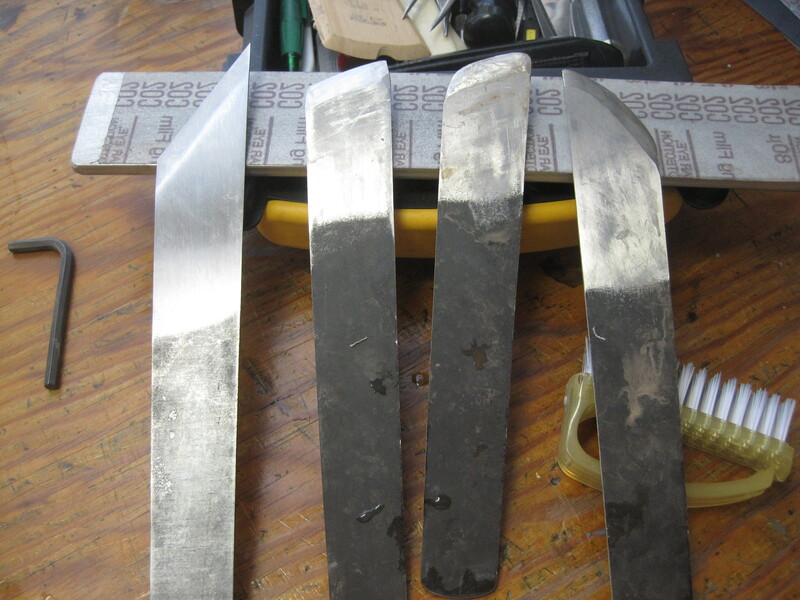 The blanks having been shaped, I progressed to the actual sharpening process. We learned to make our own knives when I was at North Bennet Street School, as I have mentioned in this blog before. Although that process was painful, frustrating, and time-consuming, filled with lots of whining, crying, and the sharing of disturbing nightmares among my fellow students (Mark, I’m so sorry we put you through all that! ), now I feel totally confident when dealing with anything knife-related, from small hand tools to board shears and guillotines. Since then and now, I have had a lot of time to think about steel, its uses, types, and qualities, and observe the tools I see in the field. 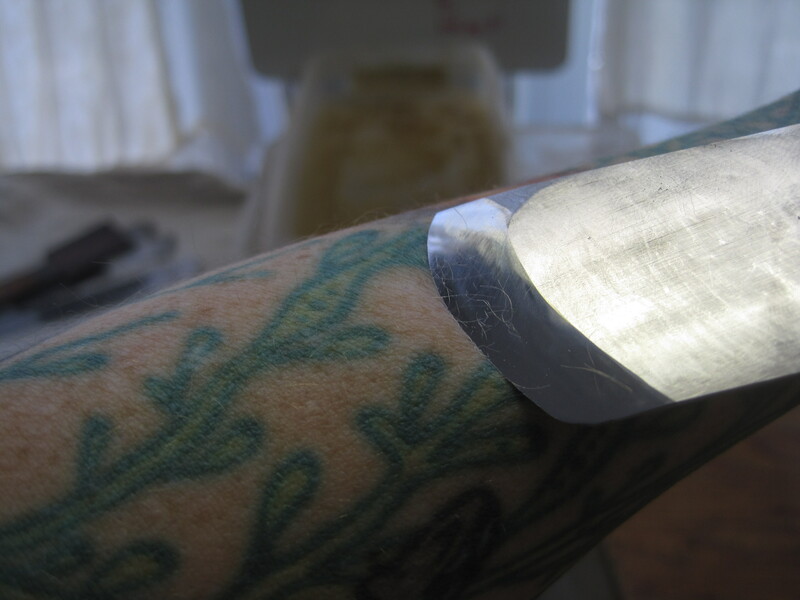 I can appreciate the extreme hardness of the steel we use for our bookbinding tools. I have experienced tools that hold their edges and tools that don’t. In any case, now I use a combination of Jeff Peachey’s sharpening system, a dry system which uses disposable sheets of progressively-smaller grit microabrasive papers, and my good old Japanese water stones from school. The 6000 grit water stone with nigura stone in the foreground. Finishing strop is to the right, and three knife blanks at the back (with my own lifting knife in its sheath on top). Although the adhesive-backed papers are really easy to use, and much cleaner than the water stones, I used the water stones to create the edges on my seven students’ lifting knives. From left to right: a Hewit paring knife I use as a blank; two right-handed lifting knives after being sharpened on a Peachey slab of 80-micron sandpaper, left-handed knife after same. The cleanup is worth it when you make multiple knives, and I try in general to stay away from disposable stuff unless the convenience really makes a difference. Well, the water stones really came through for me today, and though the knives are all a little irregularly- shaped, I am really happy with the bevel angle and the fact that they’re all sharp enough to shave. Ready for a class full of eager future book conservators! It’s shaving! You can see here the hair on the bevel. Game on, bookbinders! By comparison, this oft-published etching of Roger Payne from 1800 shows what happens when a bookbinder works alone in a garret for too long, though Payne took the status and skill level of bookbinding much farther than anyone working in the trade at the time. Is there some kind of line to be drawn between happy bookbinders working in concert with one another and unhappy, solitary, dark souls, hammering out reading material fit for the bookshelves of a king? I don’t think it’s quite that simple these days; however, one thing I do know is that it’s great to get together with other bookbinders and swap horror stories, tall tales of glory, and of course, just a sliver of plain old-fashioned gossip. Some might call this “shop talk”, but since no bookbinder I know works in anything similar to what is known as a “shop”, perhaps we can call it kvetching? Venting? 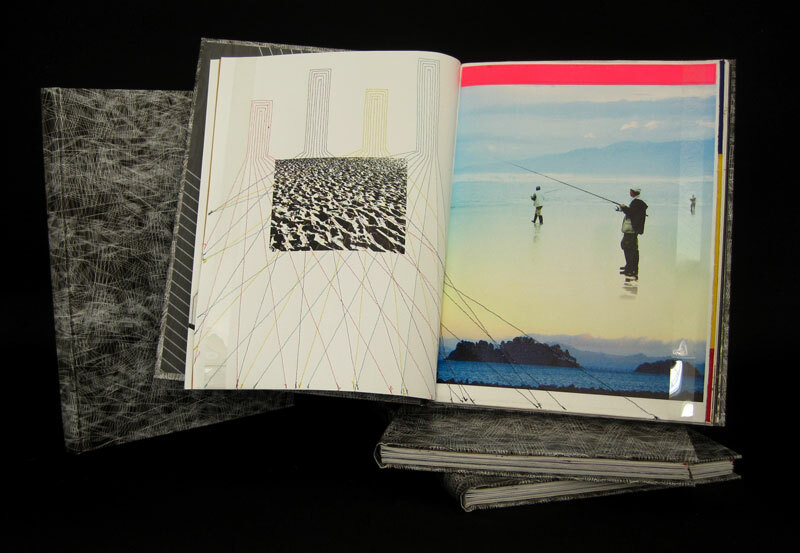 Or just the modern bookbinding version of shop talk. My old friend and compatriot in bookbinding from Chicago, Karen Hanmer, visited San Francisco for a few days in October to teach her brilliant way of doing things, and I was ultralucky enough to host this Famous Bookbinder while she taught here. Karen’s formal training in bookbinding is from the American Academy of Bookbinding, but my immense respect for her stems from the fact that experience is her guide, and she is constantly working and trying new techniques and binding styles. The space race of the 1950s, the early history of computers, and midwestern prairie imagery figure heavily in her work, and I must confess some envy of her quirky creative perspective. She and her husband travel by train almost everywhere they go, and they’ve taken some pretty neat trips together. I also like Karen’s unpretentiousness, her humility about her own work, her uncompromising work ethic, and her desire to learn something from every project regardless of how well it turns out. 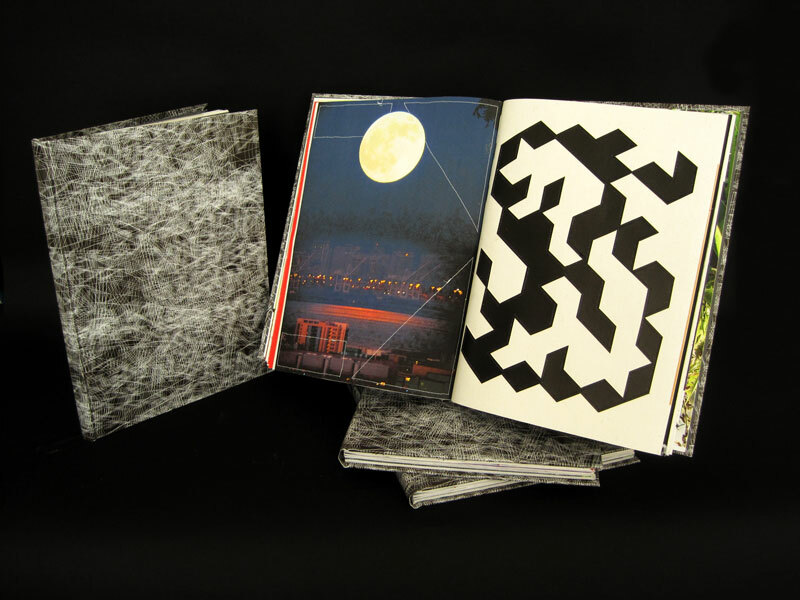 Over the years I have seen Karen’s work evolve and her focus change and change again, and it is fascinating to me how dynamic the field of bookbinding seems when I think about the range of projects she has taken on. Typically I am not a “content guy”, as some have noted– rather more interested in technique and structure, but Karen’s creative work inspires me to devote more time and energy to design, color, and maybe even one day, content. That is one quality of a great friend– he or she likes you as you are, but will also draw you outside your comfort zone and encourage you, either literally or by example, to try new things. When we both lived in Chicago, we would show each other our worst binding mistakes, the most embarrassing boo-boos or bad design choices, and we assuaged each others’ guilty feelings as only the best friends do. Will do better next time and keep soldiering on. While Karen was here, we didn’t have too overmuch time for hanging out– she taught classes over four full days, mostly to full groups of ten students. It is exhausting to be on stage all that time for anyone, and I also had to work each day she was here except Saturday. We would eat dinner together and pretty much pass out just after! On her last day here in San Francisco, we went to see the mural by Diego Rivera at City College. It’s something I’ve always meant to do, but never devoted the time to doing it, and it was amazing. It’s remarkable that the mural is open to the public, viewable anytime the theater is open (11-4 Tuesday through Saturday). There was a student docent (history major, no less!) sitting near the mural to answer questions about it, and he was really helpful and informative. Thanks for visiting, Karen! I’ll miss you! And thanks to Hand Bookbinders of California and the San Francisco Center for the Book for arranging for Karen to teach here. I am excited to be doing some work for Dana Smith and Steve Macdonald. 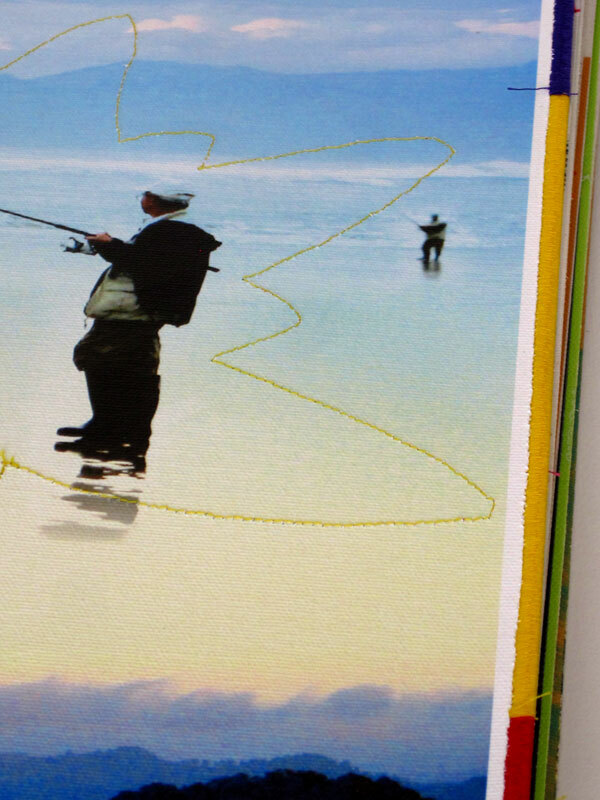 I’ll be binding a total of 27 copies of their book Sweet Call and Response. 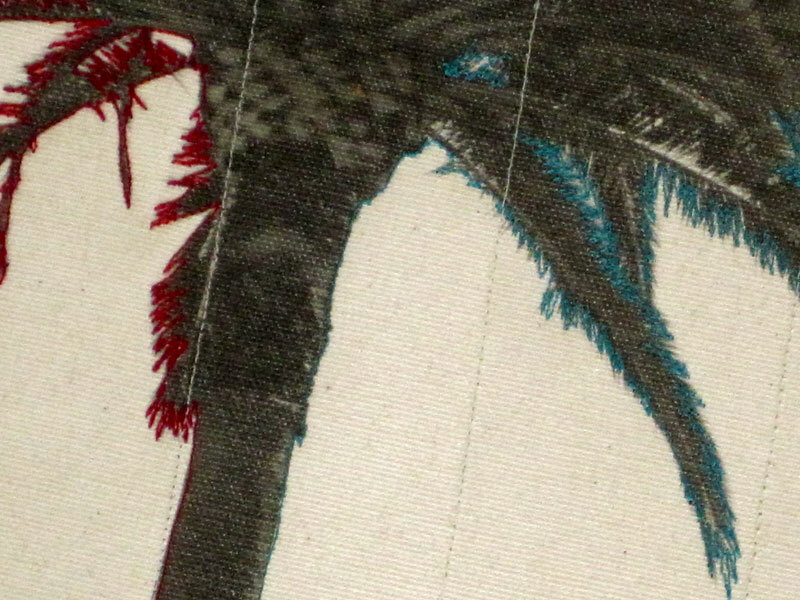 I love this work and how the printed imagery combines with embroidered shading, blocks of color, and detail work. They’ve dropped off two giant stacks of raw pages for me to sew and bind into hard covers just today, so I’m about to get cracking at it! I’ve already bound some advance copies for them, and here are some images of those books that are already complete. 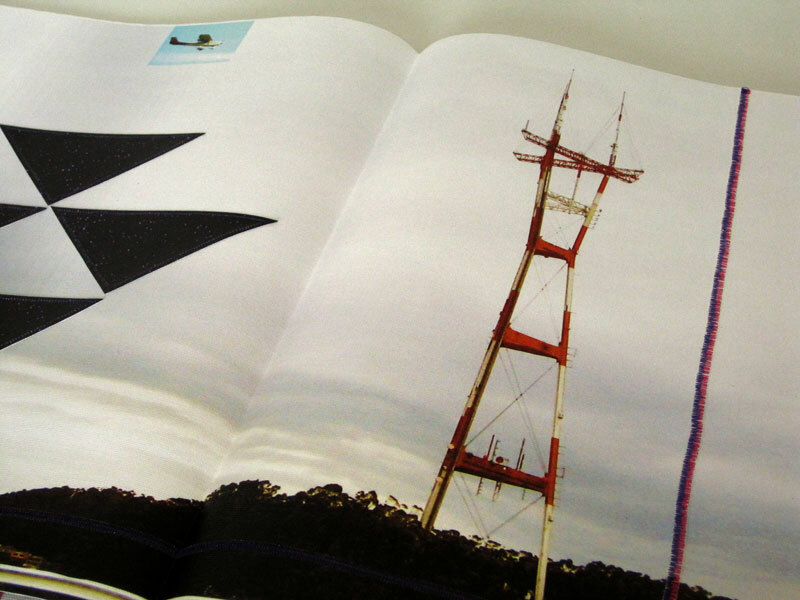 You can see more of this book, and Dana’s work, here. 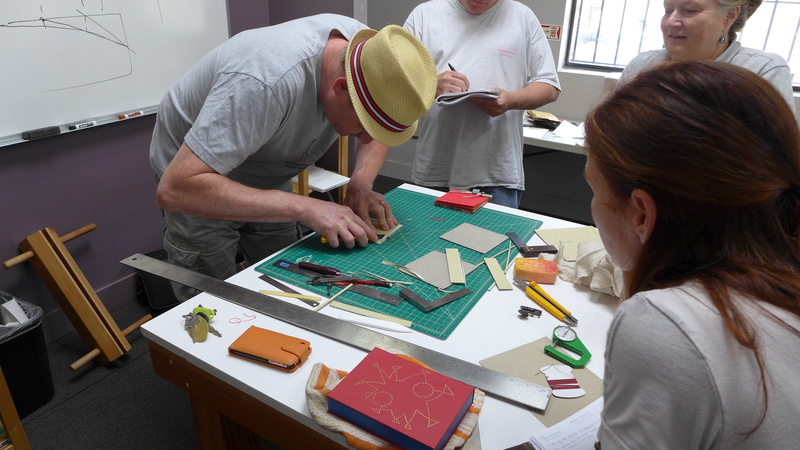 Soon another round of Beginning Bookbinding at the San Francisco Center for the Book will begin. As of today, there are only three spots left in this class, which runs on Wednesday evenings in June and July. 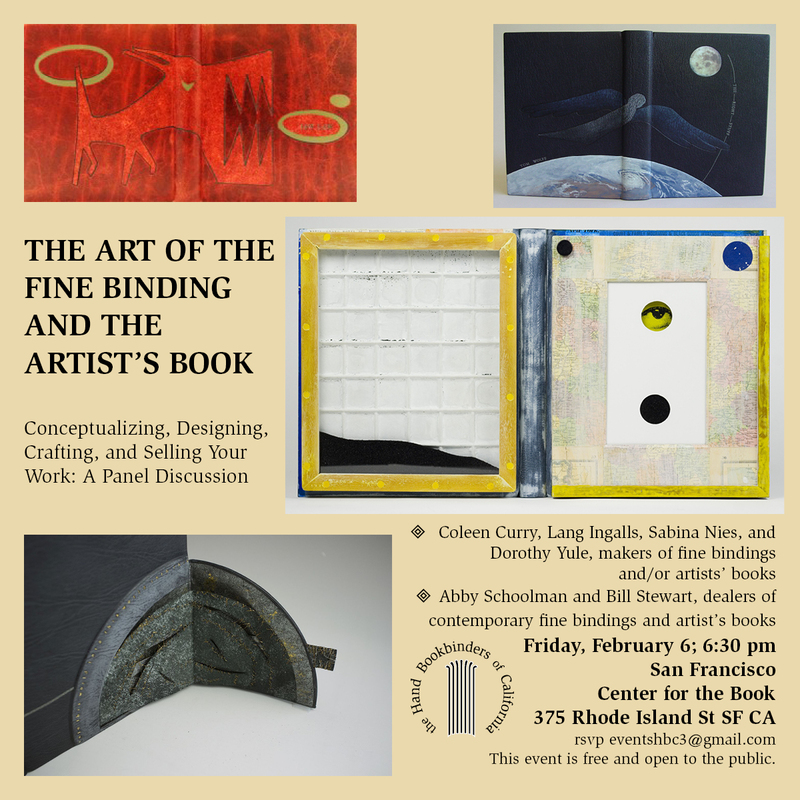 Beginning Bookbinding is the first half of the certificate program at SFCB, and is structured to provide a hearty, solid foundation in bookbinding, focusing on hand sewn books with hard covers. It is heartening for me to work with such students as I have been extremely lucky to have! It’s been a lot of fun, and much has been learned by all. 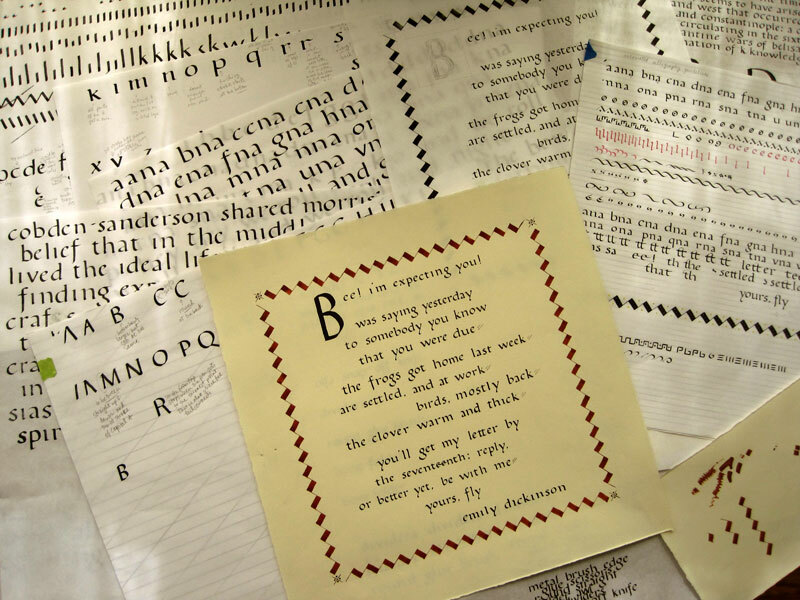 Speaking of classes, I just completed a round of calligraphy classes (as a student!) through the Friends of Calligraphy. Judy Detrick was our amazing instructor for (you guessed it) Book Hand. I love the legible, circular shapes of Book and Foundational hands and their connection to greater developments in the history of the book. I’ve tried to learn Book Hand on my own, reading, absorbing, and practicing for a few years, but nothing compares to personal attention from an extremely skilled practitioner of the craft. My writing is still pretty humble, but much improved, and much easier and enjoyable to practice now that I know some tips from a pro! However, it is now time for me to, as they used to say, “return to our regularly scheduled programming” (live television broadcasts seem so far removed from me these days, yet ingrained my memory! )… Anyway… back to the books!